Come out to help support OUR FUNDRAISER! For one low price, you can get charcoal basted CHICKEN, fresh PULLED PORK, two homemade sides, and fresh baked cornbread. 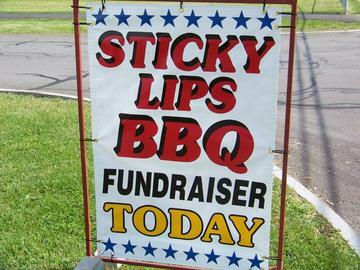 Everyone who buys a ticket gets a FREE Appetizer Card, good for up to a $7 value at either Sticky Lips BBQ restaurant. After purchasing, ticket buyers must PRINT YOUR TICKETS and present them on day of event for accounting purposes. Would you rather pay in cash? Buy a ticket in person at the event! Online ticket sales end at 4pm on the previous day.